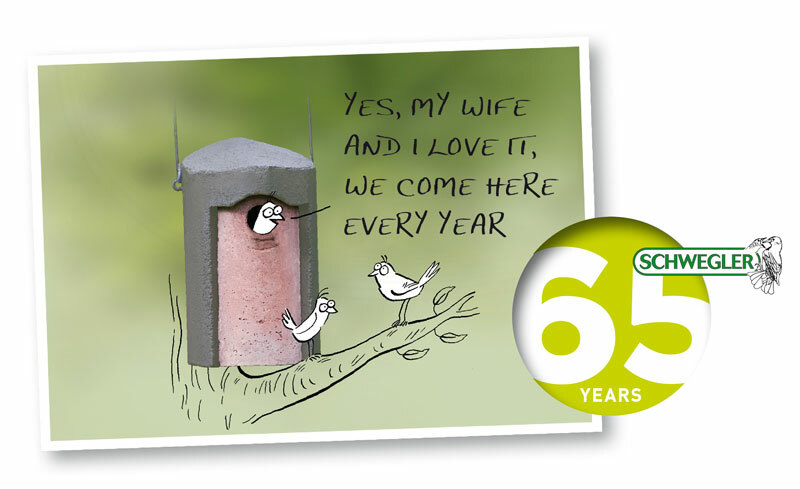 For over 65 years SCHWEGLER has been “the” brand for bird and nature conservation products in Europe. After such a long time, it is not always easy to keep sight of this standard, especially in our ever-changing world. Family owned for three generations, knowledge of our roots guarantees continuity and gives our customers the certainty that with its product diversity, SCHWEGLER is and remains a reliable partner in practical nature conservation work. Our high-quality SCHWEGLER wood-concrete nesting aids are species-­appropriate, breathable, and resistant to weather as well as other negative phenomena such as rot and Woodpecker attacks. The enormous success of our products with maximum occupancy rates has been substantiated scientifically for decades, among other things by innumerable recommendations of leading international nature conservation associations, government establishments, charitable organisations and enthusiastic customers. The nesting aids do their job reliably for many years and decades, but at the same time use few resources in their production. Their environmental impact at the end of their life is minimal and even without special disposal they do not constitute lasting foreign bodies in nature. We pay particular attention to a healthy ecological balance and perform a life cycle assessment of our production and when purchasing materials: We generally use wood from domestic sources (usually with sustainability certificate for panels) and we ensure short delivery and sales routes for low energy consumption. Our nest boxes are made to last, but if a part does break or need replacing, we can supply spare parts, even decades later. Our wood and wood-concrete products are made exclusively in our factory in Germany. Wherever possible we purchase raw materials and semi-finished goods that have been produced in Germany or Europe, to fulfil our responsibilities here too. We pack our products with as few plastics as possible and also reuse existing outer packaging (e.g. cardboard boxes). Orders that are delivered by parcel service are sent CO2 neutral; if products are shipped on pallets we optimise the packaging, for example, using recycled paper and cardboard padding. All this is not an idea thought up by our marketing department, but has been an important part of our business philosophy for as long as the company has existed. We take our responsibility in this area very seriously and here too we try to meet our own high standards, especially through consistent compliance with social and environmental protection standards. Nature conservation is not merely limited to attaching a nesting aid. Equally, production, support, maintenance and disposal are also important aspects. The objective of our efforts is simple, and yet sets the benchmark very high: We give wild animals the opportunity to survive in our modern, changing world; not only now but in the future too, to conserve them for our children and our children’s children and to pass on our enthusiasm for this too. We hope you find endless pleasure in living nature.